Most people, as we have seen, limit their preparation for approaching the most awesome mystery of Holy Communion to [simply] fasting. Through this blessed means of fasting the Devil deceives them and leads them into "judgment and condemnation" by having them "unworthy commune," while they deceive themselves into thinking that, having fasted completely mechanically, they have [fully] followed the proper preparation and thus are communing worthily. We have seen [however] that prior to Holy Communion . . . it is not necessary for one to fast more than the fast established by the Church (Wednesdays, Fridays, Lents and other fasting periods and days.) [This is in addition to not eating or drinking the morning of the service.] It is, of course, implied that one will not approach unprepared. What, then is this preparation? Faith in the Sacrament of Holy Communion, faith that in the holy chalice Christ Himself is present physically, faith, more specifically, that Holy Communion is a most necessary nourishment for the spiritual life, makes the believer long for and strongly desire to come into direct contact, to become one with Christ. The first Christians were "every day keeping watch all together in the temple" (Acts 2:46). This watching, this burning longing, must exist in the believer's heart . . . This longing for frequent Holy Communion grows with the thought that Holy Communion in the present life is the betrothal for the complete communion with God in the future life. Holy Communion, in other words is a basic presupposition for us to inherit the Kingdom of Heaven. It should be noted that the longing for frequent Holy Communion is the result of our fervent love for Christ, of divine eros. For this reason, a little prior to the great moment of Holy Communion, we say, "Thou hast burned me with longing, O Christ, and changed me by Thy divine eros." In order for us to commune, we ought to examine ourselves, if we are in a position to commune. This is specifically commanded by the Apostle Paul: "Let a man examine himself, and so let him eat of that bread and drink of that cup. For he who eats and drinks in an unworthy manner eats and drinks judgment to himself not discerning the Lord's body" (Cor. 11:28-29). An investigation of ourselves, in a quiet time and following prayer, will show us whether we are able to approach Holy Communion. But be careful! In this self examination we must be neither supersensitive nor senseless. We said elsewhere also that no one is completely worthy to commune, and that Holy Communion is not a reward for the saint, but a strengthening for sinners struggling for holiness. The self examination and self censure of a spiritual person never has an exonerating result. The faithful Christian always declares himself guilty. But one declaration of guilt varies from another declaration of guilt. If from this self examination one catches himself guilty of grave sins, such as sins of the flesh, explosions of anger, a serious dispute with another person, etc., then he should consider that he cannot commune without confession. If, however, he catches himself guilty of "easily forgivable" sins, which even the greatest saint - bearing flesh and dwelling in the world - commits, then he may decide, with a feeling of this sinfulness of course, to commune . . . The believer who has his or her spiritual father's blessing to commune frequently, every Sunday examines his conscience, and if it does not witness that he committed "grave" sins, he proceeds to the remaining stages of preparation for Holy Communion. And this is because he will never have an absolutely clear conscience. In this case Holy Communion is received unto the remission of sins. As a recent theologian says, "the believer doesn't commune of the most pure Sacrament because he has the witness of his conscience that he is worthy for this - because all people are a priori unworthy of Holy Communion - but he communes taking courage in the infinite mercy and grace of the Lord, Who calls him to receive remission of his sins, communion of the Holy Spirit, and sanctification and strength to continue his journey in the world toward the Kingdom of Heaven." If, however, the self examination shows the believer to be guilty of sins which prevent him from Holy Communion, then a very basic presupposition of participating in the spotless Sacrament is confession. If, in order to participate in a common meal, you feel the need to first wash your hands, how much more so must you feel the need to first wash your soul in the bath of sacred confession in order to participate in the sacred and spiritual Table of heavenly food? There in the confessional before the appointed spiritual father, the Blood of Christ, "which was poured out for the life and salvation of the world," is united with fervent tears of the person who is sincerely repenting, and the cleansing and brightening of the soul comes about. Every believer feels the need for confession before Holy Communion. Before the spiritual father he repeats the confessional words of the prodigal, "Father, I have sinned before heaven and before you, and am no longer worthy to be called your son" (Luke 15:21). With contrition of heart he confesses his sins. With tears he manifests his repentance. And he hears the consoling phrase from the spiritual father, "Child, your sins are forgiven" (Mark 2:5). His joy after confession is great, both because his sins were remitted, and because he will be able to commune of the Immaculate Sacrament, as long as the spiritual father allows it. Prepare yourselves spiritually, mainly through confession, and approach after the feasts. When you commune having prepared yourselves, you have a feast and celebration in your heart. You have a true Christmas and a true Easter whenever you commune worthily. Communing unprepared, however, and furthermore unconfessed, you place fire within you, because Holy Communion is 'fire burning the unworthy.' Please prepare yourselves first, and then approach. Holy Communion is a work of love. Out of love, out of great love, God, in the second person of the Godhead, communed people, that is, He came to earth, incarnated and "dwelt among men." Out of great love He gave Himself as a sacrifice for us. Out of great love He poured out His precious blood. 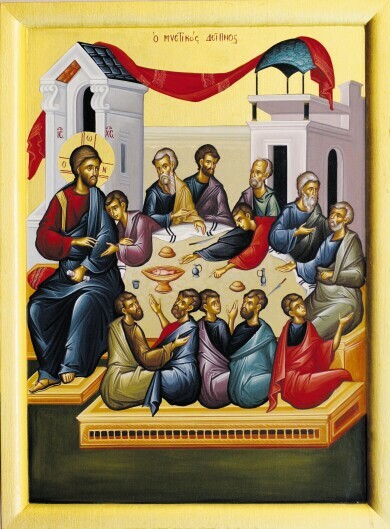 And out of great love He is offered unto eating and drinking to the faithful in the mystery of Holy Communion. "But God, who is rich in mercy, because of His great love with which He loved us, even when we were dead in trespasses, made us alive with Christ" (Eph. 2:4-5). Through Holy Communion we are made alive. Out of great love He communed with us, became one with us. And we ought out of great love to become one with Him, to commune of His Body and His Blood. Our approaching Holy Communion depends on the love we have for Christ. Whoever strongly loves Christ, whoever above every other love has his love for Christ, he it is who longs to converse with the beloved Jesus in prayer, to diligently hear the voice of his Beloved in the study of Holy Scripture and to frequently unite with his Beloved in Holy Communion. Divine eros, fervent love for Christ, urges one toward frequent Holy Communion. If the love grows cold, then the longing for Holy Communion diminishes, or the receiving of Holy Communion becomes mechanical and thus unto judgment and condemnation. Now for preparation of the soul for Holy Communion, love for people is also absolutely necessary, which furthermore is the proof of one's love for God. The disciple of love, the evangelist John, in his first Epistle combines three loves: God's love for us, our love for God, and our love for others. "We love Him because He first loved us. If someone says, 'I love God,' and hates his brother, he is a liar; for he who does not love his brother whom he has seen, how can he love God whom he has not seen? And this commandment we have from Him: that he who loves God must love his brother also" (1 John 4:19-21). Christ in His Sermon on the Mount stresses that reconciliation or making up with the people with whom we do not have a good relationship must precede our offering and worship in the temple. "Therefore if you bring your gift to the altar and there remember that your brother has something against you, leave your gift there before the altar, and go your way. First be reconciled to your brother, and then come and offer your gift" (Matt. 5:23-24). For this reason, also in the beginning of the service of Holy Communion, as a basic presupposition for approaching Holy Communion, reconciliation and making up with others is stressed: "As thou approachest, O mortal to receive the Body of the Master, Draw near with awe lest thou be seared; It is fire. And when thou drinkest the Holy Blood unto Communion, First reconcile with those who grieve thee, Then with courage receive the Mystic Food." The sacred Chrysostom also protests and says that no one having enemies and hating them can approach the sacred Table. Do you want to take Holy Communion? Don't feel hate and antipathy for anyone; have love for everyone. Unfortunately, there are Christians, who even when they are about to commune, do not seek forgiveness of others. This is how they think: "Why should I ask for forgiveness? And what if the other one took this as my weakness and wanted to misuse me? Then I would not be at fault. He would be at fault and he ought to ask me for forgiveness" . . . Oh, harshness, which is the daughter of egotism! . . . So a basic presupposition for Holy Communion is love for others. It is a good idea prior to Holy Communion, from the evening before, to seek forgiveness from the people in our family or in our surrounding. And let children kiss the hands of their parents and ask for their forgiveness and their blessing. In order for the believer to commune, for example, next Sunday, all that week he is careful with himself. He prepares a welcome for the Lord of glory. He adorns his soul to receive the divine Pearl. He pays attention so that nothing happens to him which might deprive him of the joy of Holy Communion. And he prays daily with contrition to be granted the great gift. More especially on Saturday evening and on Sunday morning he carefully reads the Service Before Holy Communion. 1. The Canon, which is said the night preceding Holy Communion, in the evening, as part of the service of the Small Compline. 2. The psalms and the prayers prior to Holy Communion, which are said by the believer in the morning at home or in the Church. These are Psalms 22, 13, and 115, and about ten other prayers from the Fathers. In the beginning of the prayers the need for special prayer before Holy Communion is stressed: "Before participating in the sublime sacrifice of the lifegiving Body of the Master, pray with trembling in this way…"
3. The troparia and the verses, which are said in the Church when the dreadful time of Holy Communion approaches and while the believer is approaching the Holy Chalice. At that time the soul of the believer is at the height of sacred contrition. His soul is prepared to receive the Master of all. His lips are whispering the last words of the prayer: "Receive me today, O Son of God, as a partaker of Your mystical Supper; for I will not speak to Your enemies of Your Mystery: nor will I give You a kiss as did Judas. But as the thief I confess to You: Remember me, O Lord, in Your Kingdom." 4. The thanksgiving after Holy Communion, which is said in the Church after the conclusion of the Divine Liturgy. Unfortunately, very few people read the thanksgiving. Most receive the divine Pearl, the highest gift, and go without thanking the giver, God. They resemble the nine lepers who were cleansed by Christ, yet did not feel the need to return to thank Him. Imagine a man who receives a gift and doesn't even whisper a "thank you" but, on the contrary, abruptly turns his back and leaves hastily. Did you commune? Your were granted an invaluable gift. So why are you leaving thus? Why do you show yourself to be ungrateful? This stance of yours shows that you did not feel what gift you received. The believer who feels how great a gift Holy Communion is stands and with rejoicing says the thanksgiving prayers, which begin with these verses: "Glory to You, O God; Glory to You, O God; Glory to You, O God." A final stage of preparation for Holy Communion is fear and awe, which must exist in the believer's soul at the time he is going towards Holy Communion. The priest, holding the Holy Chalice, invites the believers: "With fear of God, faith, and love, draw near." We already spoke about faith and love as basic presuppositions for approaching Holy Communion. We need to say a few things also about the fear of God, which must exist in the believer's soul, that is, about holy fear, which comes from the feeling of sinfulness, of the sacredness of the moment and of the majesty of God, which the believer is approaching. Unfortunately, on days of crowds many believers not only do not have this sacred fear, but they also show an unheard of impiety. The unruliness, the noise and the impiety which are observed on the days of Christmas Eve, Holy Thursday, the Dormition of the Theotokos, et. Al., cause grief and frustration to every believer. This is not new to this age. We must stress the manner in which the faithful must come to the Holy Chalice: With silence; no disorder whatsoever in the line; deep attention of soul and mind to the divine Mystery. The sign of the Cross is done piously. Any lipstick has been removed. The believer takes the holy covering with both hands and puts it beneath his chin. He opens his mouth wide and receives the divine Pearl. He diligently wipes his mouth with the holy cloth. He again piously does his Cross. And the faithful return to their seats, awaiting the end of the Divine Liturgy, when they read the Thanksgiving Prayers.